After Geekyoto I was trying to figure out how much I spend on electricity. I believe people will change their habits once they know the cost. Then after receiving my electricity bill I couldn’t actually work out how much my ‘50W spot light’ costs me a day in electricity! 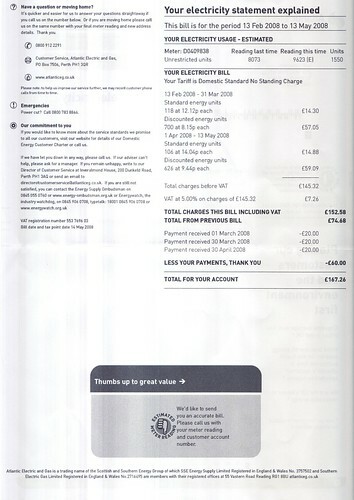 The first problem is that I paid my bill with a fixed direct debit. So I really had no idea how much electricity I was really spending per month. I called up and changed that to variable direct debit. The next problem I had, was understanding the notion of standard energy unit and discounted energy unit blocks. I won’t go into this as it is quite complex. Call up your supplier to give you a simpler fixed unit price which is somewhere in the middle. With a fixed price you now have a chance to calculate out your electricity cost.